Applying cutting-edge technologies for challenging marine survey environments. Tenera Environmental provides consulting services that include the use of a wide range of acoustics and video techniques for assessment for marine survey applications. These techniques use non-invasive acoustic methods that can be used in water too turbid for video; can be automated and, when used appropriately, provide reliable and economical data products. We can use sonar technology to estimate the number or biomass of fish, or to study fish behavior, distribution and habitat both in the water column and near the sea bed. Studies of current movement can be used to provide point velocities and/or water column profiles. 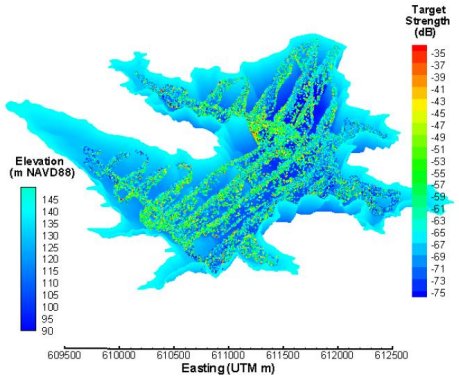 Common applications are fish enumerations around offshore intake structures, monitoring fish behavior at hydroelectric dams and other structures, or bathymetry maps that include sidescan and multi-beam imagery. Current measurements can provide information about river flows, intake approach velocities, coastal ocean currents and inputs for biological and physical modeling.